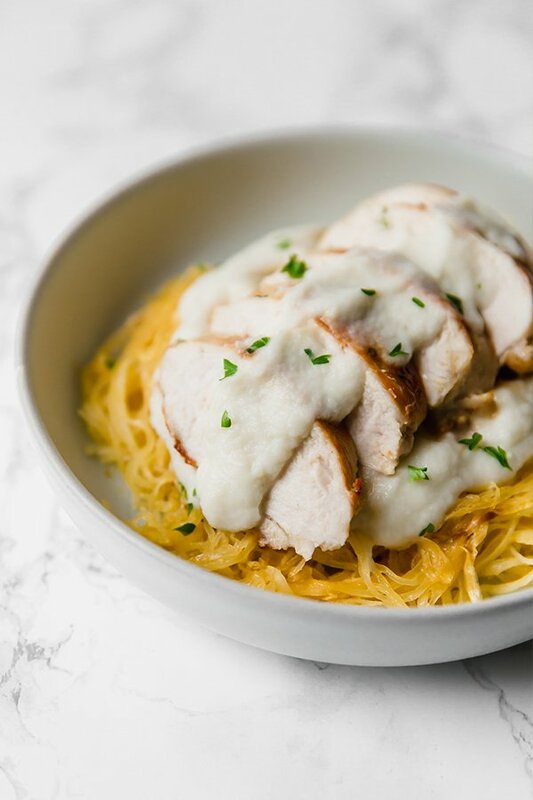 Spaghetti squash has been a staple vegetable ever since going gluten-free in college. It’s inexpensive, easy to prepare, versatile, and of course… it’s basically vegetable pasta. I used to eat my spaghetti squash with a generous helping of tomato sauce from a jar and coat it in a thick layer of that mastery shelf stable parmesan cheese. Basically… there was only one good thing about that meal for me. 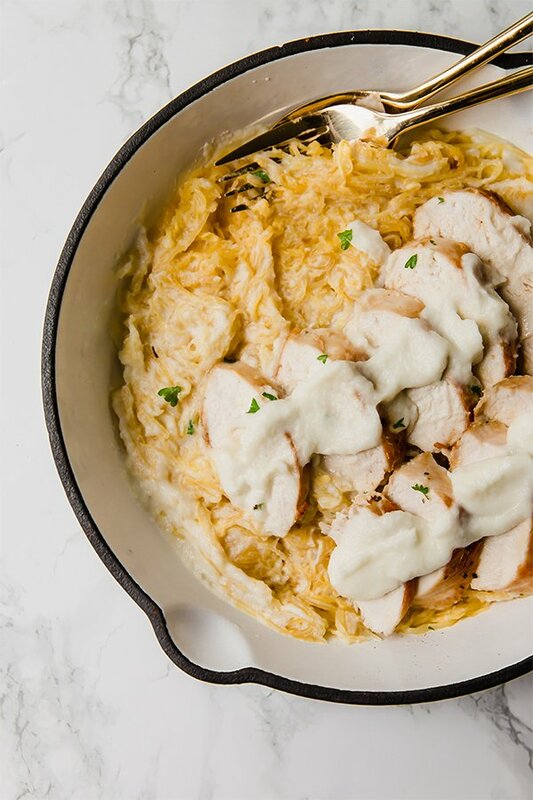 Neither tomato sauce or parmesan cheese was my friend on an autoimmune paleo template to manage my Hashimoto’s, so my classic pasta dish evolved into paleo spaghetti squash chicken Alfredo that’s also AIP and dairy free! 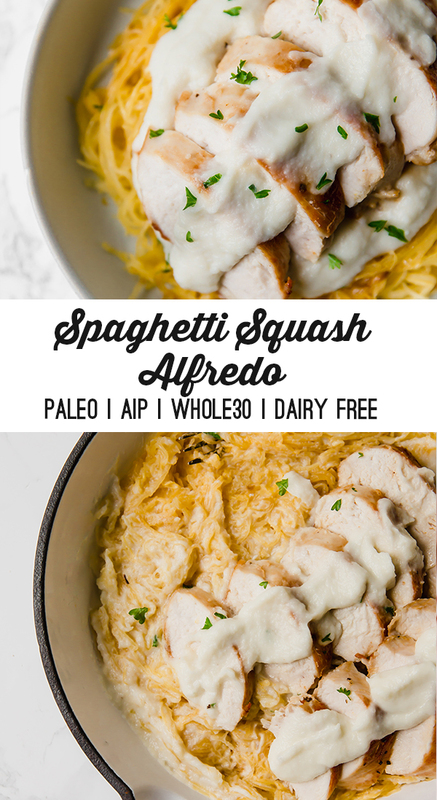 I love this dairy free alfredo on spaghetti squash. So, what’s in it? You guessed it… cauliflower! Pair cauliflower with coconut milk, and nutrient dense bone broth and it makes for a super creamy, delicious sauce for this meal. Veggie-packed, nutrient dense, and easy! For those of us who are healing chronic illness like an autoimmune disease with real food and nutrient density, this dish is the perfect way to mix it up while getting all of the healing goodness. I just love that it’s filled with healing superfoods like gut healing bone broth, two different kinds of veggies, pastured chicken, and healthy fat from avocado oil! I love using spaghetti squash in dishes like this, as well as others as a pasta substitute that’s still veggie dense. Chicken thigh or even shrimp would also be great! These are the ingredients that make up the sauce. Slice off the ends of the squash and continue to slice into rings. Spoon out the seeds and place on a baking sheet topped with avocado oil. Bake in the oven for 30-40 minutes, (flipping halfway through) until the strands easily pull. Pull out the strands and set the squash aside. Pat the chicken dry and season well with salt and pepper on each side. Heat the oil in a deep skillet on medium heat. Add the chicken to the pan and cook for 5 minutes on each side, or until the internal temperature reads 165 F. Set aside. Add the cauliflower to a medium pot and cover with water. Place on the burner on medium-low heat and bring to a low simmer. Cover and continue to simmer for about 8-10 minutes or until cauliflower is soft. Strain the cauliflower and set aside to allow to cool slightly. Using a small saute pan, heat the oil on low heat and saute the garlic until fragrant. Set aside. Add the cauliflower to a high-speed blender with the garlic, coconut milk, broth, lemon juice, nutritional yeast, salt, and pepper. Heat the avocado oil in a large skillet and add the spaghetti squash to reheat. 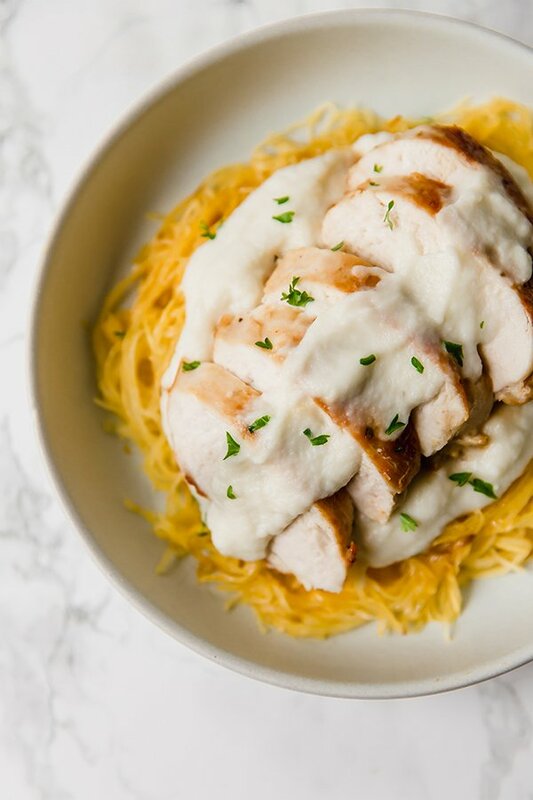 Top with alfredo sauce, sliced chicken, and chopped parsley. So! Being half Italian, I have not been able to found a ‘good enough’ pasta recipe for my picky taste buds. I wanted to try this right away! I had prepared chicken the night before so it cut my cook time, just a tip. Not only was the this recipe easy to complete, it tastes amazing! I even topped sun dried tomatoes in top which I tolerate and added a bit of fresh spinach on the bottom so it wilted under the Spaghetti squash. Well done Michelle, very authentic and satisfying. Ahh, yay!! I’m so, so glad you liked it Julie!! 😀 The addition of fresh spinach sounds amazing! Which stores sell bone broth, or do i need to make it myself ? You can buy it at whole foods, but I recommend making it. I have such a hard time finding pastured chicken! What are some tips for finding it?? This recipe sounds so delish!! I can’t wait to try it this week. If I make a large batch can it be frozen? Thanks! Thank you Gladys! I haven’t tried to freeze it, but it should work fine. Enjoy! This is such a good recipe! I loved the flavor! And I really appreciate your tip on how to cook the spaghetti squash. Mine always came out watery before. Instead of using a head of cauliflower, can I take a short cut and used riced cauliflower for the blender instead? This was delicious! The sauce was very creamy, and I love that it made plenty (of sauce) so you aren’t fighting your family for the last drop. Thanks for a delicious and easy recipe! So glad you liked it! Thank you Kathleen!! Is there a good substitute for cauliflower in this recipe? I can’t have cauliflower but this recipe looks so good!